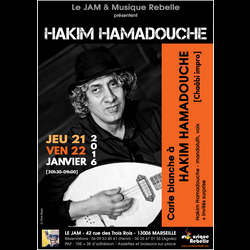 Raised in Marseilles, musician and singer Hakim Hamadouche is best known for being the mandolute player of French-Algerian raï singer Rachid Taha with whom he collaborates since 1991. 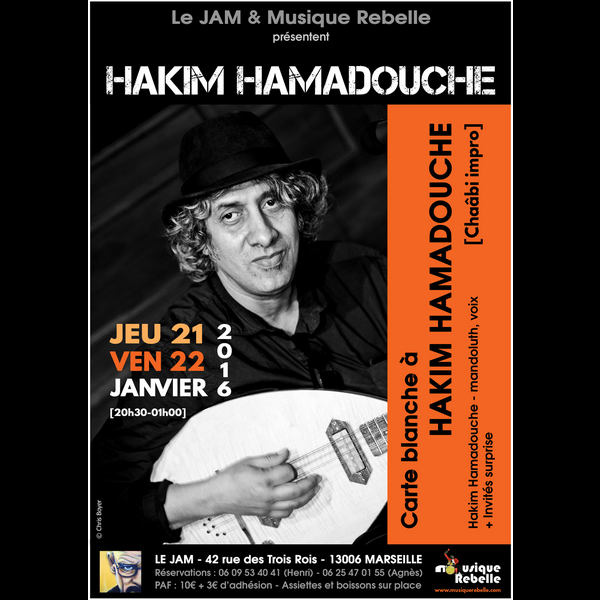 In 1995, he created the band Oriental Fusion with Ahmad Compaoré and Edmond Hosdikian. His various collaborations - in the field of jazz, rock and world music - include Lili Boniche, Patti Smith, Bill Laswell, the band Les Têtes Raides or Tricky. His lute playing and raucous singing recall the beautiful melodies of Northern Africa and its oriental rhythms.